Teacher Kim Bitting, far left, helps Pleasant Oaks Preschool students make get-well cards recently for Elkhart County Sheriff's Department officer Robert Yarger. Doctors are trying to determine if Yarger, who has lupus and heart disease, is in good enough health to be placed on a heart donor list. Yarger is scheduled for valve replacement surgery in Indianapolis Friday if his lungs test strong enough. With Bitting are students Kate Ahonen, Alex Schrock and Alyssa Drinkwine (with ponytail), who is Yarger's niece. 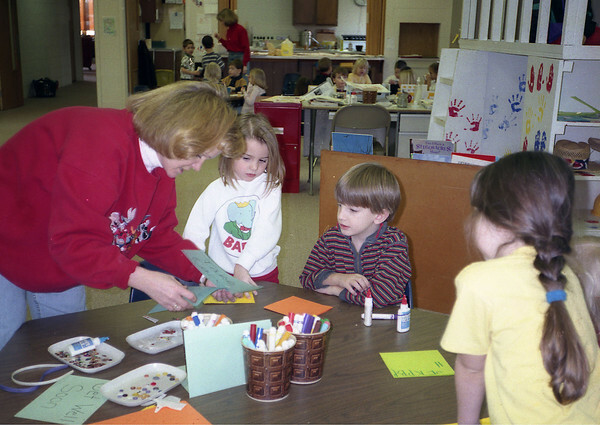 The preschool is located in the Pleasant Oaks Mennonite Church in Middlebury.